Published by Ruralite Services, Inc.
Nonmember display advertising welcome. Rates and specifications available, upon request. Published around the 14th of each month, datelined for upcoming month. 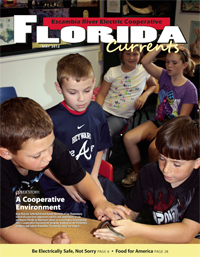 As a voice of Florida’s electric cooperatives, Florida Currents reaches more than 92,000 readers through five zoned editions. It focuses on personality features, local outdoor and travel activities, the safe and efficient use of electricity, food and stories of general interest to Florida readers.